Aim High Wants To Put You In The Show... Or Whatever - Are You Screening? So, in case you were waiting for the day that you could say that you’d really heard everything… today’s the day. A new “show” is coming your way via Facebook, and you could see parts of “yourself” in the show… sort of. Check this one out. Frankly, I don’t get it, but what do you think? Warner Bros. Digital Distribution (WBDD) today announced the first-ever “social series” from a Hollywood studio will debut on Facebook starting October 18. Consumers can now become part of the show by seamlessly integrating their profile information – including photos, text and friends – by simply opting into the application on the show’s Facebook page. 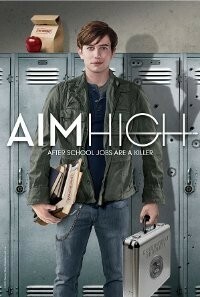 The action comedy series “Aim High” produced by Warner Premiere and Dolphin Entertainment, staring Jackson Rathbone (“Twilight”), Aimee Teegarden (“Friday Night Lights”), and Greg Germann (“Ally McBeal”) will debut as the first “social series” October 18 through Facebook (www.facebook.com/aimhighseries) and Cambio.com. By choosing to watch “Aim High” in a personalized viewing mode through the show’s Facebook page, viewers will be able to see themselves or their friends integrated into select scenes throughout the series – from their photo appearing on a student body election poster, to having their name seen as graffiti on the bathroom wall. This video application not only allows consumers to have an immersive and engaging viewing experience, but also a social one where they can share comments, scenes and Tweets about their favorite moments from the show. To learn more about “Aim High,” visit www.facebook.com/aimhighseries. “Aim High” is the story of a young man leading a double life – juggling his studies by day and serving as a government operative by night. This series chronicles the life of Nick Green, a junior who’s just starting a new school year as one of the country’s 64 highly trained teenage operatives. When he’s not handling international spies, Nick is dreaming of Amanda Miles, the most popular girl in school who’s cool, intelligent and very alluring. Amanda mercilessly flirts with Nick, but before he can enjoy her advances he has to avoid Derek – her overly protective boyfriend who threatens him for even looking at her. “Aim High,” a Warner Premiere and Dolphin Entertainment series, comes from Director/Producer McG (“Chuck,” “Charlie’s Angels”), Wonderland Sound and Vision. Peter Murrieta (“Wizards of Waverly Place”) is Executive Producer. Mary Viola, Andy Shapiro, Jackson Rathbone, Bill O’Dowd, Jim Henrie and Philip von Alvensleben also serve as Executive Producers. The series is written and created by Heath Corson and Richie Keen who also serve as Executive Producers, directed by Thor Freudenthal (“Hotel for Dogs,” “Diary of a Wimpy Kid”) and produced by Lance Sloane and McG.